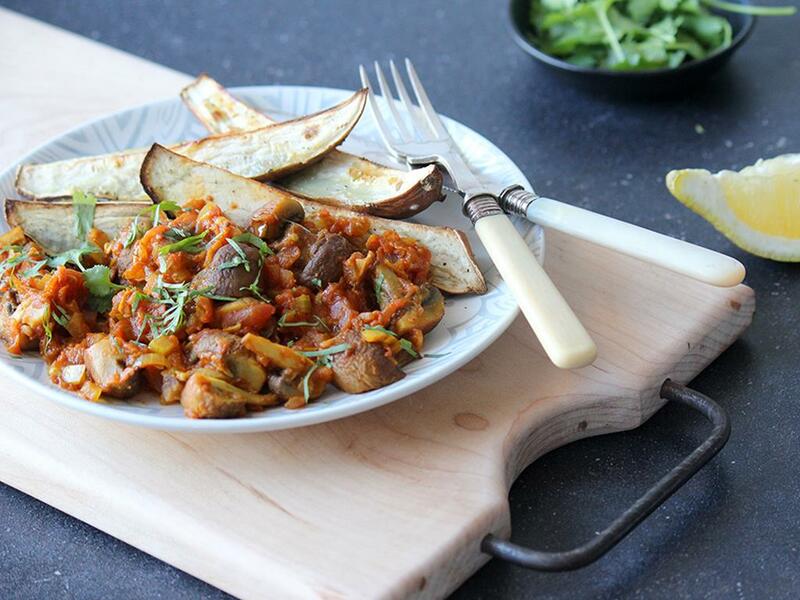 Roast sweet potatoes topped with mushrooms coated in a garam masala spiced tomato sauce. Sweet potatoes & mushrooms: Place the sweet potatoes on a tin foil lined baking tray with a drizzle of olive oil and season with salt and pepper. Mix, arrange in a single layer and roast for 30 minutes until golden and cooked. Place the mushrooms on a separate tray with a drizzle of olive oil and salt and pepper. Mix, arrange in a single layer and roast for 20 minutes until cooked. Tomato masala mushrooms: Place a pan on medium-high heat with a drizzle of olive oil. Add the onion with a pinch of salt and cook for 5 minutes. Add the garlic with the Curry Masala Spice Mix, tomato paste and water (1 tbsp for 4; ½ tbsp for 2). Cook for 1 minute, then add the tomatoes, season with salt and pepper and cook for 8-10 minutes until the sauce thickens. Mix in the roasted mushrooms, a squeeze of lemon juice and fresh coriander. Season to taste. Serve the roasted sweet potato boats topped with the tomato masala mushrooms.